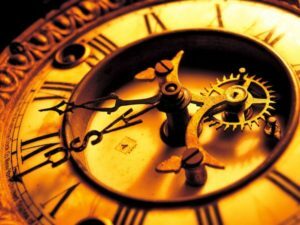 The History of clocks covers a very long period, and there have been many different types of clocks over the centuries. Not all historians agree on the history of the clock. The word clock was first used in the 14th century (about 700 years ago). It comes from the word for bell in Latin (“clocca”). At best, historians know that 5000 – 6000 years ago, great civilisations in the Middle East and North Africa started to examine forms of clock-making instead of working with only the monthly and annual calendar. Little is known on exactly how these forms worked or indeed the actual deconstruction of the time, but it has been suggested that the intention was to maximise time available to achieve more as the size of the population grew. Perhaps such future periods of time were intented to benefit the community by allotting specific lengths of time to tasks. Was this the beginning of the working week? The first way that people could tell the time was by looking at the sun as it crossed the sky. When the sun was directly overhead in the sky, it was the middle of the day, or noon. When the sun was close to the horizon, it was either early morning (sunrise) or early evening (sunset). Telling the time was not very accurate. With the disappearance of any ancient civilisation, such as the Sumerian culture, knowledge is also lost. Whilst we can but hypothesise on the reasons of why the equivalent to the modern wristwatch was never completed, we know that the ancient Egyptians were next to layout a system of dividing the day into parts, similar to hours. ‘Obelisks’ (tall four-sided tapered monuments) were carefully constructed and even purposefully geographically located we believe around 3500 BC. A shadow was cast as the Sun moved across the sky by the obelisk, which it appears was then marked out in sections, allowing people to clearly see the two halves of the day. Some of the sections have also been found to indicate the ‘year’s longest and shortest days’, which it is thought were developments added later to allow identification of other important time subdivisions. Another ancient Egyptian ‘shadow clock’ or ‘sundial’ has been discovered to have been in use around 1500 BC, which allowed the measuring of the passage of ‘hours’. The sections were divided into ten parts, with two ‘twilight hours’ indicated, occurring in the morning and the evening. For it to work successfully then at midday or noon, the device had to be turned 180 degrees to measure the afternoon hours. The Egyptians also used the ‘Merkhet’, the oldest known astronomical tool, which is believed to have been developed around 600 BC. Two merkhets were used to establish a north-south line which was achieved by lining them up with the ‘Pole Star’. This enabled the measurement of night-time hours, when certain stars crossed the marked meridian. By 30 BC, ‘Vitruvius’ describes thirteen different sundial styles being used across Greece, Asia Minor, and Italy, inherently demonstrating how the development must have grown to be more complex. Around 1400 B.C. (about 3,400 years ago), water clocks were invented in Egypt. The name for a water clock is clepsydra (pronounced KLEP-suh-druh). A water clock was made of two containers of water, one higher than the other. Water traveled from the higher container to the lower container through a tube connecting the containers. The containers had marks showing the water level, and the marks told the time. Look at the picture right. Water drips from the higher container to the lower container. As the water level rises in the lower container, it raises the float on the surface of the water. The float is connected to a stick with notches, and as the stick rises, the notches turn a gear, which moves the hand that points to the time. ‘Water clocks’ were among the earliest time keeping devices that didn’t use the observation of the celestial bodies to calculate the passage of time. The ancient Greeks, it is believed, began using water clocks around 325 BC. Most of these clocks were used to determine the hours of the night, but may have also been used during daylight. An inherent problem with the water clock was that they were not totally accurate, as the system of measurement was based on the flow of water either into, or out of, a container which had markers around the sides. Another very similar form was that of a bowl that sank during a period as it was filled of water from a regulated flow. It is known that water clocks were common across the Middle East, and that these were still being used in North Africa during the early part of the twentieth-century. In the Far East, mechanised ‘astronomical’ and ‘astrological’ clock-making is known to have developed between 200-1300 AD. In 1088 AD, ‘Su Sung’ and his colleagues designed and constructed a highly complex mechanism that incorporated a water-driven escapement, invented about 725 AD. It was over seven metres in height and had all manor of mechanisms running simultaneously. During each hour an observer could view the movement of a power-driven armillary sphere, constructed of bronze rings, an automatically rotating celestial globe, together with five doors that allowed an enticing glimpse of seeing individual statues, all of which rang bells, banged gongs or held inscribed tablets showing the hour or a special time of the day. The appearance and actions would have appeared similar to the automaton we know so well today. The Greeks divided the year into twelve parts that are called months. They divided each month into thirty parts that are called days. Their year had a total of 360 days, or 12 times 30 (12 x 30 = 360). Since the Earth goes around the Sun in one year and follows an almost circular path, the Greeks decided to divide the circle into 360 degrees. The Egyptians and Babylonians decided to divide the day from sunrise to sunset into twelve parts that are called hours. They also divided the night, the time from sunset to sunrise, into twelve hours. But the day and the night are not the same length, and the length of the day and night also changes through the year. This system of measuring the time was not very accurate because the length of an hour changed depending on the time of year. This meant that water clocks had to be adjusted every day. Somebody finally figured out that by dividing the whole day into 24 hours of equal length (12 hours of the day plus 12 hours of the night), the time could be measured much more accurately. Why was the day and night divided into 12 parts? Twelve is about the number of moon cycles in a year, so it is a special number in many cultures. The hour is divided into 60 minutes, and each minute is divided into 60 seconds. The idea of dividing the hour and minute into 60 parts comes from the Sumerian sexagesimal system, which is based on the number 60. This system was developed about 4,000 years ago. 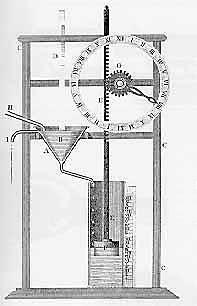 In 1656, ‘Christian Huygens’ (Dutch scientist), made the first ‘Pendulum clock’, with a mechanism using a ‘natural’ period of oscillation. ‘Galileo Galilei’ is credited, in most historical books, for inventing the pendulum as early as 1582, but his design was not built before his death. Huygens’ clock ,when built, had an error of ‘less than only one minute a day’. This was a massive leap in the development of maintaining accuracy, as this had previously never been achieved. Later refinements to the pendulum clock reduced this margin of error to ‘less than 10 seconds a day’. Huygens, in 1657, developed what is known today as the ‘balance wheel and spring assembly’, which is still found in some of today’s wrist watches. This allowed watches of the seventeenth-century to keep accuracy of time to approximately ten minutes a day. Meanwhile, in London, England (UK) in 1671, ‘William Clement’ began building clocks with an ‘anchor’ or ‘recoil’ escapement, which interfered even less with the perpetual motion of the pendulum system of clock. ‘George Graham’, in 1721, invented a design with the degree of accuracy to ‘one second a day’ by compensating for changes in the pendulum’s length caused by temperature variations. The mechanical clock continued to develop until they achieved an accuracy of ‘a hundredth-of-a-second a day’, when the pendulum clock became the accepted standard in most astronomical observatories. Quartz Crystal ClocksQuartz is a type of crystal that looks like glass. When you apply voltage, or electricity, and pressure, the quartz crystal vibrates or oscillates at a very constant frequency or rate. The vibration moves the clock’s hands very precisely. Quartz crystal clocks were invented in 1920. Europe. During the period of 500-1500 AD, the development of time measuring devices in Europe is known not to have improved in any great way technologically, relying mainly on the use of the sundial and principles of measurement used in ancient Egypt. These dials were placed above doorways and indicated the midday and four ‘tides’ or times of the sunlit day. In the tenth-century, one English (UK) model showed the marking of the tides compensated for including seasonal changes caused by the Sun’s altitude. In Italy, during the early-to-mid fourteenth-century, large mechanical clocks housed in towers began to appear in several of the large cities. These clocks appear to have been plagued by the same problem as that of the ‘water clock’, that of regulating the mechanisms and maintaining the accurate time. This appears to have been due to the oscillation period of the escapement depending on a driving force which had sufficient friction in the drive mechanism. A technological advance came with the invention of the ‘Spring-powered’ clock, around 1500-1510, credited to ‘Peter Henlein’ of Nuremberg (Germany). These were instantly popular although the spring-powered clock did have one problem, that of slowing down when the mainspring unwound. In the sixteenth-century, and even through until the nineteenth-century, these clocks were mainly the reserve of the wealthy, when the reduced size meant it could now be put on a mantle shelf or table. The development of the spring-powered clock was the precursor to accurate time keeping. Because the Earth turns, it is daytime in part of the world when it is nighttime on the other side of the world. In 1884, delegates from 25 countries met and agreed to divide the world into time zones. If you draw a line around the middle of the Earth, it is a circle (equator). The delegates divided the 360 degrees of the circle into 24 zones, each 15 degrees (24 x 15 = 360). They decided to start counting from Greenwich, England, which is 0 degrees longitude. 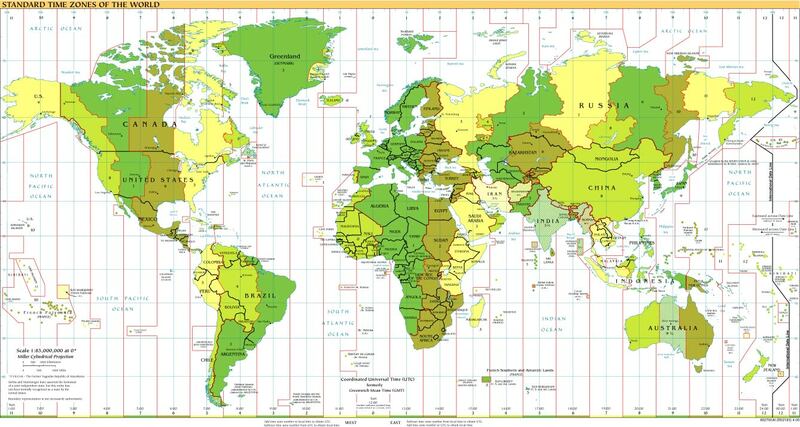 To see a larger picture of the standard time zones of the world, click the picture below.